It was again another busy weekend and am still working on processing all the photos from it. 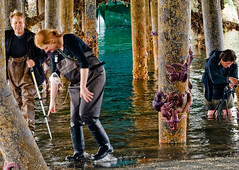 I took Thursday off from work to shoot the low tide (-4 ft) at Lincoln Park in West Seattle. It was pouring down rain at my house and looked like it was raining pretty hard everywhere around Puget Sound. I was chatting with a friend online before heading out and he offered to loan me his Olympus E3 camera which is the high end DSLR that is splash proof and will function fine even in a downpour. I accepted the offer and stopped to pick it up in Burien on my way to West Seattle. It ended up not raining at all by the time I got to the park. The camera's controls are very different from what I was used to and needed a crash course before taking off with it. It didn't take long to get the hang of it. I also borrowed his FL-50R flash which can be used wirelessly without any additional equipment on the camera or flash. It just made me want one even more. I've got my low tide pics posted on Flickr. After shooting for a few hours, we had lunch at Elliott Bay Brewery where I had fish and chips and a dark hard cider. We proceeded to Cupcake Royale for cupcakes where I tried the lavender cupcake. The cupcake was a little on the dry side but the frosting seemed better than I remember for a Cupcake Royale cupcake. Not as sweet as some of the others I've had. Later that afternoon I met up with some friends for a wine tasting at Esquin where I bought a case of their summer wine sampler for $79. I just couldn't pass up that bargain. There's a wide range of wines in the case with both whites and reds. I'm beginning to wish I had a wine cellar! After the wine tasting, I headed to First Thursday Artwalk in Pioneer Square to meet up with a few others. I took a few pics which I still need to get posted. Was going to have dinner at J&M but the service was pretty much non-existant after sitting at a table for about 20 minutes. We decided to leave and ended up at Trattoria Mitchelli, down the street and had a salad and a piece of yummy pizza. Dinner was followed by a Sake tasting which I had never done before. It was pretty tasty. It was all this place sold. I didn't know there were so many. I decided to get out of the house for a change for the 4th this year and went to a BBQ at a friend's in Fremont that lives close to Gasworks. Didn't have too much trouble finding parking since I got there around 4:30. Most of us went to watch the fireworks near the bridge and ended up finding some good spots. We hung out for a little while afterwards at the nearby friend's place till traffic died down and had no trouble getting home afterwards. Fireworks pics will be posted in the next couple of days. Sunday, I had a ladies brunch at a friend's. There was a long list of wonderfully delicious drinks and food. Strawberry Mint Sangria, Cucumber Sangria, sliced fruit with creme fraiche, goat cheese tart with mixed greens, grilled chicken apple sausage, grilled asparagus and onion, chedder dill scones, grapefruit sorbet, and mixed berry blitzes. Twas a yummy brunch. Some food pics from the brunch will be coming soon as well. I also got some utility sink supplies over the weekend to have installed tomorrow in my laundry room where I'm hoping to get a dark room set up. If you know how to process film and would like to come over some time to give me some pointers, I'll feed you in exchange. I'm only planning on developing black & white at this point. I don't think I'll get into color processing.